Fur is a trendy fashion accessory these days. Most of the merchandise consumers see in retail stores is made with so-called "faux fur" or "fake" fur. But, one local store is actually selling handbags made of real fur. Consumers hit retail outlet Marshalls in Redlands and were stunned and angry to find out that the store was selling pricey handbags made of various real fur. "It's shocking to me in today's age that this would still go on," said Christine Williams, a self-proclaimed animal lover. 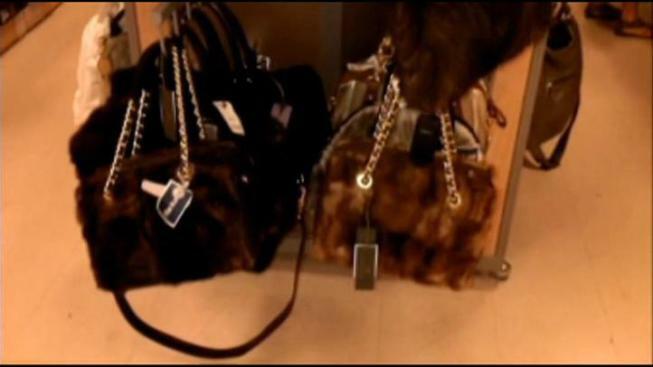 NBC4 found Italian-made mink purses with price tags ranging between $200 and $500. One bag was made of rabbit, pony and cow. "They are popular, but I wouldn't carry one," said a young woman re-stocking the supply. A store manager said, "They're a good seller. We've been carrying them over a year and people love them." Diane Shephard of Yucaipa still hangs on to a couple of mink stoles and a coat that belonged to her late mother. But, she does not necessarily advocate retailers selling them. "We really value animals. We don't want to kill them unless we eat them. And, this is more of a green society," said Shephard. Williams, too is outraged that retailers like Marshalls are offering real fur to consumers. "It was disgusting to feel it and it was shocking to see the price and to know that it was even going on still. I really thought that it had slowed down," she said. Williams, along with NBC4, contacted PETA, who told us: "Every bag, shoe or coat made from a preserved skin of a dead cow, pony, rabbit or other animal means that a living being who felt pain was locked up and skinned, all in the name of fashion." "I just wouldn't buy a pony purse or anything, especially for $500," said Shephard. "I wouldn't even buy it for $1." PETA's Jane Dollinger also said that compassionate consumers realize there are cruelty free, animal-friendly options available instead of real fur. Siding with PETA, Williams calls herself a "compassionate consumer," who has traded leather handbags for cotton. She said she would like to see the mink purses taken down at Marshalls. "I'm faux everything. I'm just not one who can do it," she said. NBC4 has reached out to Marshall's corporate headquarters. We have not yet received a response from them.